Location: Saint-André-en-Vivarais, in the Ain departement of France (Rhone-Alpes Region). 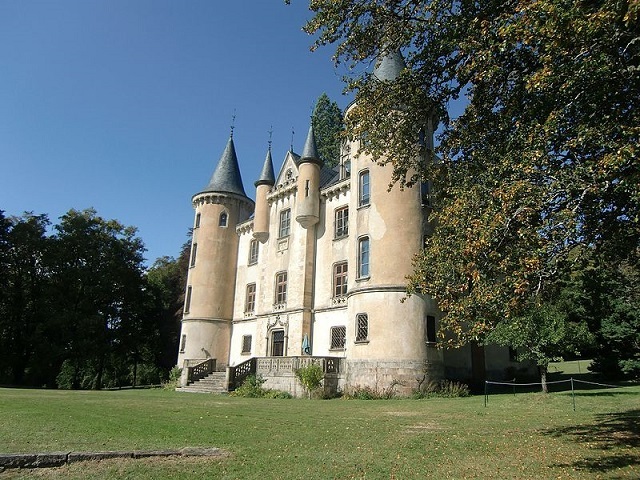 Notes: The castle of Montivert is located in the commune of Saint-André-en-Vivarais in the department of Ardèche.The first castle, a stronghold consisting of a body and two dungeons, was built in the thirteenth century. Several families succeeded one another: the Iserdands, Montaignac, Vire du Liron. The castle then underwent several transformations. In the middle of the eighteenth century, it was again modified by Gabrielle Vire du Liron. Around 1857, Lacroix-Laval built a new castle (the present castle) with outbuildings, attributed to the architect Pierre Martin. The architecture comes from a research on the Middle Ages and the Renaissance. Indeed the building is made up of a quadrilateral flanked with watchtowers, false machicolations and round towers. However, the agricultural buildings were built by the architect Jean-Prosper Bissuel.